Tuakau (Māori: Tūākau) is a town in the Waikato region, formerly part of the Auckland Region until 2010, when it became part of Waikato District in the North Island of New Zealand. The town serves to support local farming, and is the residence of many employees of New Zealand Steel at Glenbrook. The place name is believed to be a geographical reference to the high bluff nearby that offers views down the Waikato river. In Māori the word Tū can mean ‘to stand’ and ākau ‘river bank’. The area was first used as a trading centre for passing waka that would transport goods up and down the Waikato River. A flour mill was built in 1855. In 1863 war broke out just south of the river and the New Zealand Government stationed in Tuakau Imperial troops brought over from Great Britain. [clarification needed] To help defend the area the Alexandra Redoubt was built as a defensive fort on the bluff near the river.The existing town which was originally intended to be built closer to the Waikato River was subsequently built in an area 2km further inland. The railway from Auckland reached Tuakau in 1875, when the Tuakau Railway Station was opened. By 1914 the people of Tuakau had formed their own town district which went on to achieve borough status on 1 January 1955. Amalgamations since 1989 has seen it first become part of the Franklin District governed by a District Council and then in 2010 with border changes saw it became part of Waikato District when present-day Auckland Council boundaries were created. Tuakau has two marae, affiliated with hapū of Waikato Tainui. Ngā Tai e Rua Marae and its Ngā Tai e Rua meeting house are a meeting place Ngāti Āmaru, Ngāti Koheriki and Ngāti Tiipa. Tauranganui Marae and its Rangiwahitu meeting house are a meeting place for Ngāti Āmaru and Ngāti Tiipa. The town’s ‘Tuakau Bridge’ replaced the need for a ferry from November 1902. A span of the original wooden bridge collapsed on 23 August 1929 and was replaced by the current £24,000 ($2.9m at 2015 prices), 750 ft (230 m) bridge from 22 June 1933, designed by Jones & Adams, who also built Horotiu (1921), Te Aroha (1926), Ngamuwahine River (1930) and Fairfield bridges (1937). It was once part of State Highway 22. About 3 km (1.9 mi) upstream from Tuakau Bridge, at the end of Brown Rd, the river is crossed by the First Gas 400-line gas transmission pipe, which supplies gas from the Maui gas pipeline at Rotowaro to Auckland and Northland. The 350 mm (14 in) pipe crosses on a 376 m (411 yd), 11 pier, truss bridge, 14 m (46 ft) above the water, which was built in 1980 and renovated in 2007. 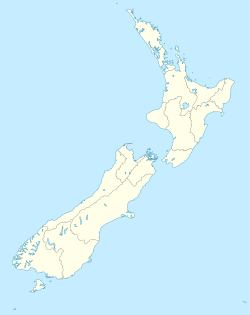 The 2013 Census showed 4,182 people usually live in Tuakau. This is an increase of 681 people, or 19.5 percent, since the 2006 Census. The ethnic makeup of the town and surrounding areas is predominately European and Māori. The main primary school is Tuakau Primary, where Sir Edmund Hillary and Hugh Poland were educated. Harrisville Primary is at the northern reach of Tuakau. Tuakau College with a roll over 600 caters for Year 7 to 13 students. ^ "Tuakau Travel Guide". Jasons Travel Media. ^ "MAORI MILLS. (Maori Messenger : Te Karere Maori, 1855-03-01)". paperspast.natlib.govt.nz National Library of New Zealand. Retrieved 24 April 2017. ^ "BRIDGE OVER WAIKATO (New Zealand Herald, 1933-03-28)". paperspast.natlib.govt.nz National Library of New Zealand. Retrieved 25 March 2017. ^ "Papers Past — Auckland Star — 24 August 1929 — Page 9". paperspast.natlib.govt.nz (with 2 photos). Retrieved 17 April 2016. ^ "Proposed New Concrete Bridge Across The Waikato River At Tuakau. The Raglan County Council Has Decided To Adopt The Proposal To Re-erect The Tuakau Bridge At An Estimated Cost Of £24,000. The Structure Will Be The First Reinforced Concrete Bowstring Girder Type Of Bridge To Be Erected In This Country. The Engineers Are Messrs. Jones And Adams. (with photo)". New Zealand Herald. 30 May 1930. p. 8. Retrieved 17 April 2016. ^ "Search the List | Fairfield Bridge | Heritage New Zealand". www.heritage.org.nz. Retrieved 17 April 2016. ^ "New Zealand Topographic Map - NZ Topo Map". NZ Topo Map. Retrieved 9 November 2017. ^ "GAS TRANSMISSION ASSET MANAGEMENT PLAN – 2016" (PDF). First Gas. ^ "Case Study: Waikato River Aerial Crossing. New Zealand" (PDF). Vector Gas. 2007. ^ Scholefield, Guy, ed. (1940). A Dictionary of New Zealand Biography : M–Addenda (PDF). II. Wellington: Department of Internal Affairs. p. 172. Retrieved 13 December 2015.